The Level 2 HSK exam tests students on reading and listening skills only, and the written portion of the exam includes Pinyin along with the Chinese characters. Students may take the internet-based exam or the handwritten exam, depending on their preference. The suggestions below will prepare you for when you take the Level 2 HSK exam. Students who pass the Level 2 HSK exam have acquired a strong understanding of basic Chinese and are able to communicate when engaged in routine, simple tasks that require a direct exchange of information on familiar topics. In addition to learning Level 2 HSK grammar, you will also learn 300 Chinese characters prior to passing the exam. HSK (Level II) test is made up of listening comprehension and reading comprehension sections and contains 60 items. The test will last for 55 minutes in total (including 5 minutes in which test takers fill in personal information). Part I contains 10 items. Test takers will listen to each item twice. Each item is a sentence. A picture will be given on the test paper and test takers should judge if the content of the picture is right or wrong based on what he/she has heard. Part II contains 10 items. Test takers will listen to each item twice. Each item is a dialogue. Several pictures are given on the test paper and test takers should select the one corresponding with what he/she has heard. Part III contains 10 items. Test takers will listen to each item twice. For each item, two people make a dialogue of two sentences, and another person will raise a question based on the dialogue. 3 options will be given on the test paper and test takers should select the answer based on what he/she has heard. Part IV contains 5 items. Test takers will listen to each item twice. For each item, two persons make a dialogue of 4 to 5 sentences, and another person will raise a question based on the dialogue. 3 options will be given on the test paper and test takers should select the answer based on what he/she has heard. Part I contains 5 items. Several pictures are given on the test paper. For each item, one sentence is given and test takers should select the picture corresponding with the content of the sentence. Part II contains 5 items. 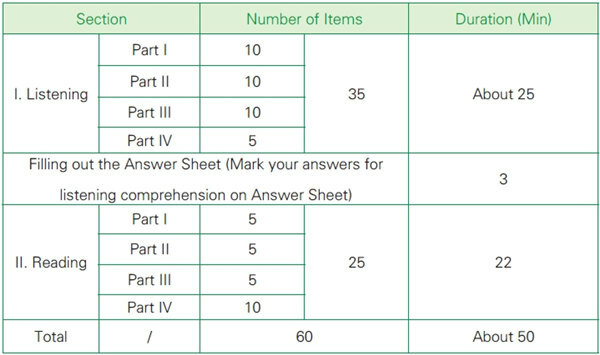 For each item, one or two sentences are given with one blank, and test takers should select the best choice from the options offered to make the sentence(s) complete. Part III contains 5 items. For each item, two sentences are given and test takers should judge if the second sentence corresponds with the first one in content. Part IV contains 10 items. 20 sentences are given and test takers should find out the matchup relationship. The test score report includes listening, reading, and total scores. A score of 120 or more represents a pass. HSK scores used for applications to Chinese Institutions of higher learning are valid for 2 years from the test date. Longer periods of validity may be recognized in other contexts. 1. Focus on vocabulary and grammar. As mentioned earlier, the Level 2 HSK exam only tests students on reading and listening. You should learn the 300 basic Chinese characters that will be on the test. (The Vocabulary Book for HSK1-3 is available on Amazon for this purpose, or you can download the vocabulary list online.) Look through the vocabulary that you are already familiar with, and use flashcards or Pleco (card & dictionary system) to become comfortable with new vocabulary words. After learning the vocabulary for the exam, you could type it on your computer or write the Pinyin by hand to further prepare yourself. 2. Take a mock test. This is an excellent way to determine whether you are really ready to take the exam or not. Mock papers online are timed, which is helpful because it’s more like the real exam. Additionally, you will receive a score after you’re finished with the mock exam. The Level 2 HSK exam mock papers are available for download online, or you can purchase the HSK2 book on Amazon (but make sure you get the official ones). 3. Improve your reading & listening skills. Before the recording begins, you have time to browse through the questions. This will help you determine the type of information you should be listening for in particular; carefully focus on the beginning of every question, as it will allow you to be more prepared. While studying for the Level 2 HSK exam, you should read various books to increase your reading speed. Chinese Breeze books is a great resource for improving your skill in reading Chinese. Don’t rely solely on mock exams; build your reading skill and speed as well. 4. Do well on the exam. When you take the exam, be sure to carefully pay attention to the proctor’s instructions. Raise your hand and let the proctor know if you are having difficulty hearing or understanding what to do. Remember, you will have three minutes after listening to the audio in which you can answer the questions in the exam. This is not true of the reading portion of the exam, in which you are expected to fill in the answers as you go through each section. You have your goal set, follow these suggestions, then work towards it! Rita is a professional Mandarin teacher, and has been teaching for more than 8 years. She has a deep love for teaching Chinese. She is also a researcher for other Mandarin learning sites, where she enjoys discovering more about Chinese grammar and culture and helping more learners. She also does copy writing for TouchChinese teaching video programs on Youtube. She focuses on HSK preparation, and is in charge of HSK training courses for teachers at TouchChinese. Mandarin is a really beautiful and special language, and Rita would like help you make constant breakthroughs in your learning.